Last night we had a fabulous sushi dinner in honor of my brother. He left to go back to art school in San Fran today and for his last dinner in town he wanted sushi. So sushi it was and it sure was delicious. I am still thinking of it, wishing I had more. 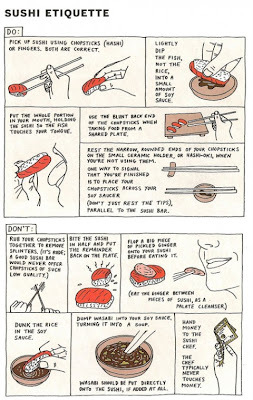 I found this cute little photo of the dos and donts of sushi eating. Its pretty interesting. I definitely break a couple of these rules, but for me, as long as I get the sushi in my mouth and no soy sauce on my white shirt then I am good to go. :) Happy sushi eating.